Couldn't find anything to replace the o2 sensor with so I removed the core and planned on welding it up. So, in usual fashion I thought about other ways to plug the hole instead of buying more wire. I tried a bolt but I couldn't get a thread as the ceramic core was chewing it up. Final solution was using old lead sinkers of the right diameter to plug the hole and beating them in with a hammer. 1 medium sinker for the external and 3 for internal. If the exhaust gets hot enough to melt the lead I think I have bigger issues. The more fuel I run through the engine the more crud collects in that massive fuel filter. Looks like that will stay on for the first couple of tanks before I upgrade to the small style. Nice job Brodie. I dig that pipe you made too. Bars would change that look alot. Somewhere 8" or even 12" narrow zeds would look the part. Would love to hear that pipe rev. Not sure about the smoke though. I haven't given people much insight into this projects direction. I have no idea what definitive style I am after. I do know what I want. So the easiest way to get some direction from you lot is to describe what I am after. As far as I am concerned I am now starting with a strong base point that I know runs well and is in good condition. To be able to haul a decent amount of gear. Such as a carton of beer as well as a small tent and a overnight bag. A comfortable long distance bike. Able to have the occasional passenger. Stand out from other bikes of this style. I don't people to see another virago. Less gap between the rear fender and tyre. Be it new shocks or fender. Bling Bling chrome. These bikes come with far to much of that to begin with. Uncomfortable riding position. I am 6'1 and 225lbs, with a stocky build. Not fat, but not fit. I don't want to be cramped up. Current seat already pushes me a bit to far forward. Dechrome as you go bud, look at Corbin for a seat that gives you some height and position should be able to go to a Harley shop and sit on them all... the Heritage has a close ride position so maybe fit with that in mind... a crash bar with highway pegs is a must for long haul and a set of rag or leather bags for camp supplies is awful nice and can be removed for town rides or DD riding. Painted a few more things black. Shocks and cam gear covers. Slowly starting to look the part. I think new bars are in order. Been a while since an update. But she is on the road as of today. Also running very rough. I expected this and have no doubt I am be cleaning the carbs again shortly. I also just ordered a new set of intake boots as I finally decided to stick with the twin carb setup. Not necessarily the two on it but that is in the future. So I had to replace the exhaust with the dual pipes it came with as the one I welded up gave me no clearance when turning. Still want different pipes but I am thinking a cone on each side might be the go. I have also been quite inspired by the HCM XV1100 build and would love to take this bike in that direction once I iron out the issues. 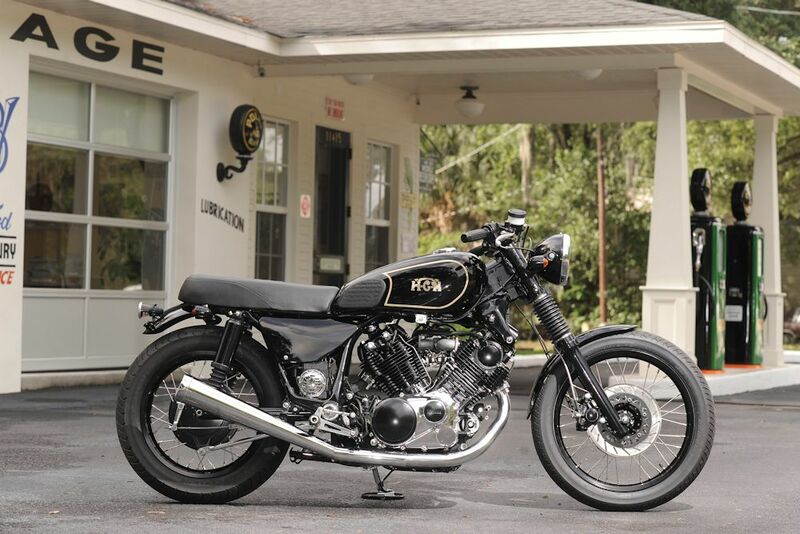 Nice work on the ol' Virago. You contemplated a single carb intake, which honestly you'd totally regret. If you're unhappy with the stock carbs, I am running VM38s on my TR1 and they are the dog's danglies. There's a 2in1 throttle cable for VM carbs and XS650-throttle-grips, which bolts up straight away and you'll need some new inlet manifolds UNLESS you skip the VM38s for TM38s as these are available with a throat in stock-carb outer diameter. I have to admit I do like Hageman's Vinrago, but I think it would be very hard to build something along the same lines, which a) wouldn't be a blatant copy or b) look right. But then, that's what's called a challenge, right? Real freedom starts with the freedom of thought.